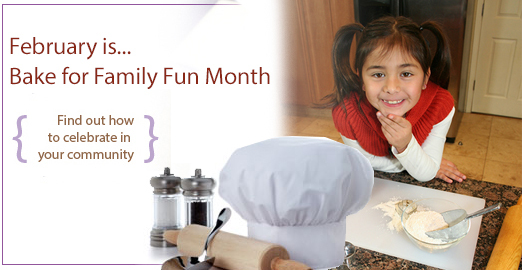 Baking is a great activity for children to learn following instructions, basic math skills, and healthy eating. The Home Baking Association has produced the following “how to” videos, as well as a fun and informative book called Baking with Friends. It looks so good you might not want to eat it! It tastes just like the dessert Grandma used to make! Includes instructions for overnight refrigerator pizza dough and par-baked pizza crusts. Try this recipe with your favorite chili! Download a free Baking Certificate from the book Baking with Friends. For this article, we interviewed Dr. Heidi Sivers Boyce, President of the Oregon Athletic Clubs, which encourages elements of healthy lifestyle for every member of the family. Before this position, Dr. Sivers Boyce owned P. B. & Ellie’s Cafe in Southwest Portland. The restaurant offered organic, local & other healthier-choice meals especially for young diners and their parents. 1. Ensure kids have healthful foods to choose from. The first step is to fill your kitchen with good-for-you foods. Avoid the processed foods marketed directly to your children (gummy fruits, juice boxes, prepackaged lunch crackers, cheese, & meats, etc.) Even adults know that it’s easier to eat healthfully when your kitchen is loaded with fresh, whole foods. 2. Allow children to choose whether or not to eat something and how much of it to eat. If a child isn’t forced to choke down something they hate, they’re more likely to give it another try in the future. 4. Make grocery shopping a family activity. Let older kids monitor the list, read labels or practice their math skills with price comparing. Make it a fun activity! 5. Play “Find the Rainbow” at the grocery store, looking for red, orange, yellow, green, blue, and purple foods that come from nature (no artificial colors allowed). This nearly guarantees a kitchen full of fruits and veggies, and since your child chose them, he or she will be more inclined to eat them. 6. Use all of the senses to interest kids in food variety, including their sense of humor. Let them help in food preparation. Present things in colorful, funny or enticing ways. For example, color your pancakes purple with pureed berries, shape your sand-wiches, or make silly faces with condiments on your burgers. These simple efforts create a safe way for kids to feel “adventurous in the kitchen,” a skill they can continue to build upon to battle normal picky eating instincts. 7. Sneak fruits and veggies as purees into favorite recipes is a great thing to do, and there are a lot of great cook books out there now with ideas. Just remember to put the natural form in front of your kiddo too. 8. When all else fails, try and try again Science has shown us that familiarity breeds liking. Take a long-term perspective and assume you’ll need to expose your children to a food 10 times before they will try it, 10 more times before they take a real bite, and 10 times after that before they like it. Patience and persistence will eventually pay off. 9. When eating out, choose your location wisely. More and more restaurants are realizing the importance of offering something for kids beyond fried foods and soda. Even if it’s not on the menu, most places will make sides such as grilled vegetables, carrot sticks, or milk or juice to drink. 10. The ultimate goal is to help kids believe that they are someone who loves healthy foods! For this article we interviewed Pamela Ellgen, a Certified Personal Trainer and cookbook author in Santa Barbara, CA. Pamela has worked with kids as young as seven and enjoys motivating them and their parents toward a healthy and active lifestyle in the gym and outdoors. …introduce a variety of outdoor activities to your family. 3. Get Online and check out resources offered by your local parks and recreation department. Even in small cities, you’ll find activities offered nearly every day of the week, especially as the weather turns warmer. 4. Plan a trip to state park for a day or even an overnight camping trip. Early, positive experiences such as these will go a long way toward building an appreciation for the outdoors in your children. 5. Climb Trees Believe it or not, tree climbing is an actual sport with classes and safety precautions. Check out the website http://www.treeclimbing.com/ to find out how you can encourage this age-old favorite among children and keep them safe at the same time. 6. Dig in the Dirt and learn a little about geology in the process. Encourage kids to catalog types of soil and rocks that they find. 7. Volunteer to clean up a local park or hiking trail. Not only will this bring your family together outdoors, but also you will model the importance of environmental stewardship and conservation. 8. Play it Safe by educating your self and your children with respect to dangerous plants and insects. Also, ensure your children have access to and use safety equipment, such as helmets and protective padding for outdoor sports. 9. Become a Member of Outdoor Nation: http://www.outdoornation.org/ and connect with other children and families who are heading outside this spring. 10. Read “Outdoor Parents, Outdoor Kids – A Guide to Getting Your Kids Active in the Great Outdoors” by author Eugene Buchanan. It will provide everything you need to know to introduce a variety of outdoor activities to your family including: paddling, hiking, climbing, swimming and many others.